Jordan Hulls is a basketball player born in Bloomington, Indiana who played for Indiana University. Jordan Hulls played the point guard position for the Hoosiers for four seasons between 2009 and 2013. The Bloomington High School South graduate was recruited by coach Tom Crean. The 6’0″ guard accumulated over 1,300 points at Indiana University and he was known for his quick-release three point shooting. He made 254 three-point attempts and shot over 44% from behind the three-point line during his career at Indiana University. Hulls currently plays in the German league Basketball Bundesliga for the team s.Oliver Würzburg. Jordan Hulls’ grandfather John was a member of coach Bob Knight’s staff at Indiana University during the early 1970s. Jordan Hulls was a 4-star PG recruit from Bloomington South High School in Bloomington, Indiana. The 6’0″ guard was ranked 139th overall in the 2009 class and he was the fourth best player in the state of Indiana, behind Purdue commit D.J. Byrd, N.C. State commit Scott Wood, and fellow Indiana commit Derek Elston. Among point guards, he was ranked 19th in the country for the 2009 recruiting class. Jordan Hulls also received an offer from Purdue University. In high school, Jordan Hulls was highly regarded as a three point shooter and floor general. In high school and beyond, Hulls played with a strong understanding of basketball positioning and he was adept in finding the open man on the floor. His three point shooting was special due to his quick release. He committed to the Indiana University Hoosiers on May 20th, 2008. He was recruited by Indiana head coach Tom Crean. On February 4th, 2009, Jordan Hulls signed his national letter of intent to play for Tom Crean and the Hoosiers. Playing for Tom Crean, Jordan Hulls played in a total of 31 games as a freshman the Hoosiers. In Tom Crean’s second season, the Hoosiers were still rebuilding from the leftover effects of the Kelvin Sampson firing. During the 2009-2010 campaign, the Hoosiers would only finish with 10 wins on the season. Jordan Hulls eventually started 17 of the 31 games that he participated in. Impressively Jordan Hulls played in all 31 games for the Hoosiers. Indiana would finish 8th overall in the Big Ten with a 10-21 record. Jordan Hulls joined an Indiana roster along with a number of players that would be critical to Indiana’s resurgence later on. Those players included Maurice Creek, Derek Elston, and Christian Watford. While not the primary guard on the team, Jordan Hulls still played key minutes averaging over 25 minutes per game during his freshman campaign. As a sophomore, Jordan Hulls benefited from the graduation of senior Devan Dumes of Indianapolis, Indiana and became the only player to start all 32 games for the Hoosiers in the 2010-2011 season. Jordan Hulls improved in every statistical category for his sophomore year. He averaged 31.2 minutes per game and shot over 41% from behind the three-point arc, which was good for 9th overall in the Big Ten that season. Jordan Hulls notably finished the season above the 90% mark for free throws. The 31.2 minutes per game average would be Jordan Hulls’ highest during his tenure at Indiana University given the talent to come. A freshman Victor Oladipo was Jordan Hull’s back court partner at the time. Even with Victor, the Hoosiers again finished below 0.500 with a 12-20 record in Tom Crean’s third season. Indiana only won three games against Big Ten teams that season and would finish 11th overall in the Big Ten. The momentum shifted for Indiana University during Jordan Hulls’ junior season. Tom Crean himself had already accumulated a 28-66 record in his first three years as the head coach of the Hoosiers. With the majority of the team as Tom Crean’s own recruits, Jordan Hulls would be a part of an important season for Indiana basketball history. After three consecutive losing seasons since the firing of Kelvin Sampson, the Hoosiers would have a bounce back season that eventually finished in the Sweet 16 and an end-of-season AP ranking of 16. As part of 2011-2012 season, Jordan Hulls and the Hoosiers defeated a #1 Kentucky team that visited Bloomington. That Kentucky Wildcat team would not lose another game for the remainder of the season and eventually went on to win the NCAA title. Jordan Hulls posted 11 points and was 50% shooting from behind the arc. Later that season, the Hoosiers would also defeat #2 Ohio State at home. Hulls led all players with 17 points and he shot an incredible 4 of 5 from behind the arc. Hulls shot nearly 50% on the season from behind the three point arc and he was second in the Big Ten overall. Indiana’s season ended in a Sweet Sixteen rematch loss against #1 seeded Kentucky in the Georgia Dome. For Jordan’s senior season, expectations were high for Tom Crean’s team after the announcement of Cody Zeller’s return along with Victor Oladipo. The Hoosiers were preseason #1 and had a tremendous amount of media attention going into the season. The Hoosiers were featured on a number of newspapers and magazines about having the best team going into the 2012-2013 season. Outlets including ESPN, USA Today, NBC, and Sports Illustrated all had Indiana as the number 1 team in the country. Jordan Hulls would be named the captain of this Indiana team. Interestingly, Indiana’s point guard of the future Yogi Ferrell announced his commitment to Indiana University and would follow under the wing of Jordan Hulls. Hulls again would play every game in the season with a total of 36 games. Indiana spent 10 weeks at the AP poll’s number one slot and would end up winning the Big Ten regular season. Despite an early exit in the Big Ten tournament, the Hoosiers still earned a number one seed going in to the 2013 NCAA tournament. The Hoosiers finished 4th in the AP polls for the 2012-2013 season after a disappointing upset to #16 seeded Syracuse in the Sweet Sixteen. Despite the finish, Jordan Hulls had a very successful senior season that would bow tie his career at Indiana University. The Bloomington native ended up being second in three point percentage again in the Big Ten. Sixth overall in three point field goals made per game and twelfth overall in assists per game. He also competed in the State Farm College 3-point challenge in Atlanta and got second place in that event. 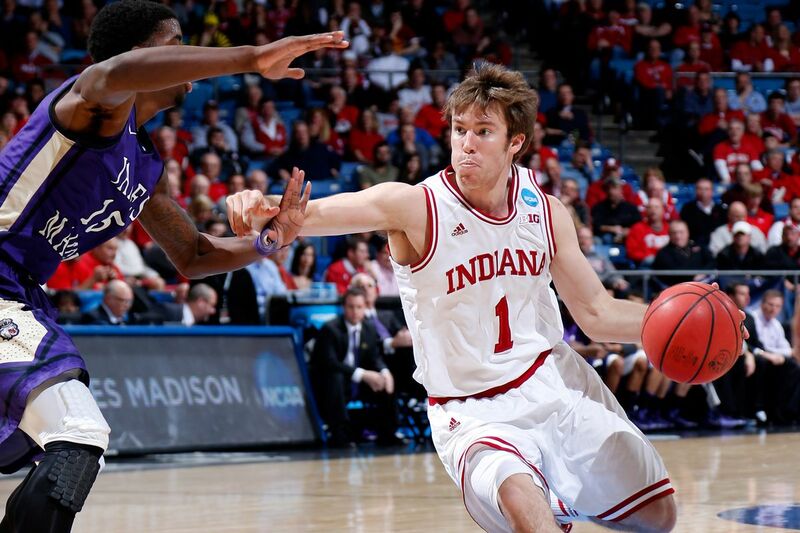 In 2009, Jordan Hulls graduated Bloomington High School South with an incredible 3.94 GPA. During his time as a Bloomington High School South Panther, he accumulated a number of records. He was the first ever basketball player to receive both the Indiana Mr.Basketball award as well as the Gatorade State Player of the Year award. His defining moment prior to college took place during Jordan’s senior year. He led his team to an undefeated 26-0 season, defeating Fort Wayne Snider 69-62 in the Indiana’s Class 4A state title that was played at the then named Canseco Fieldhouse in Indianapolis. Hulls had 14 points in the State Finals game. His career at Bloomington High School South featured averages of 15.8 points, 4.0 rebounds, 5.2 assists, and 2.6 steals per game. Jordan Hulls played for coach J.R. Holmes at Bloomington High School South. On the AAU circuit, Jordan played for Indiana Elite One who was coached by Kenny Blackwell at the time. After graduating from Indiana University in 2013, Jordan Hulls went undrafted in the 2013 NBA draft. Subsequently, Hulls found a professional team in Poland. He signed with the professional team Energa Czami of the Polish Basketball League. Since his first European contract, Jordan Hulls has continued to remain playing in the professional European circuit. Jordan Hulls is also a participant of the annual “The Basketball Tournament” or TBT for short. The tournament features both professionals and college alumni formed teams. Prize money for the tournament started off at just $1 million dollars, but has since doubled due to its popularity. All later games for “The Basketball Tournament” have been televised on ESPN. Jordan Hulls has played for the Armor Athlete team along with former Indiana teammates Will Sheehey and Christian Watford. They have made it to the tournaments quarterfinals, but lost to Overseas Elite – a team that has won over $7 million from the event. The Jordan Hulls basketball camp started in 2013 and hosts children interested in learning from the Indiana legend. Jordan Hulls hosts children anywhere from second grade all the way to 11th grade. The Jordan Hulls Basketball Skills academy focuses on basketball instruction, specifically on shooting. Bloomington High School South has been the location for the camp. Jordan Hulls also co-founded the charity known as Never Lose Hoop, which was originally named the “Hulls Foundation.” Originally, the purpose of the charity was to help offset the medical costs for his father J.C. Hulls, who went through cost cancer treatment. The family decided to grow beyond just helping his father and instead they wanted to scale bigger. The Never Lose Hoop charity now assists other children who have been affected by cancer. Through education, financial support, and emotional support, the charity helps those children impacted by the disease. The primary method of fundraising continues to focus on donations as well as a golf outing. Jordan Hulls is the son of J.C. Hulls and Joni Hulls. He has a sister that also played for Indiana University Kaila Hulls. Given his grandfather’s background in basketball, Jordan Hulls received shooting instruction at a very early age from both his father and his grandfather. John Hulls, Jordan’s grandfather, came to Indiana with Bob Knight and served as the shooting coach for the Hoosiers. Jordan’s father J.C. Hulls was an owner and trainer of the Indiana Elite basketball team before becoming an event coordinator for the Adidas Gauntlet series. J.C. Hulls had a long documented battle with cancer where he eventually had a golf ball sized tumor removed from him. On June 28th, 2015, Jordan Hulls married Aubrey Wathen in a basketball themed wedding hosted in Bloomington, Indiana. Wathen, a nurse, exchanged vows with Jordan Hulls in the St. Charles Catholic Church on Third Street. They then celebrated in the Henke Hall of Champions, which is attached to the north side of Indiana’s Memorial Stadium. Many of the Indiana Basketball traditions were incorporated into the wedding as well as other local Bloomington flair. The wedding featured candy-striped pants, Bloomington’s DJ Unique, catering from the Big Cheeze food truck, and of course teammates of Jordan Hulls during his time at Indiana University. Jordan Hulls and his wife introduced their first child in 2017. Jackson Hulls was born with medical challenges due to arriving 10 weeks prematurely, but he has since overcome those issues and is a healthy baby. Weighing only 3 lbs and 11 ounces, the 16.5 inch tall infant had to be closely monitored. Jackson Hulls was born in the United States with his primary medical care-taking in Evansville, Indiana’s Deaconess Women’s Hospital. Würzburg, Germany since Jordan was playing in Germany during the time of his birth.